You can recreate a little taste of your Florida vacation at home with these recipes, (until your next visit). Dip filet of grouper in melted butter and dredge in Cajun blackfish seasoning. Place filet on hot flattop griddle for about 5 minutes and then flip over. Place slices of marble rye bread on griddle, top each with Thousand Island dressing and slices of Swiss cheese. Place sauerkraut on griddle. When the cheese is melted and the bread toasted, place filet on one slice of the bread. Top filet and the other slice of bread with warm sauerkraut. 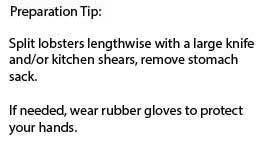 Remove sandwich from griddle, cut on a bias and plate with a pickle spear. 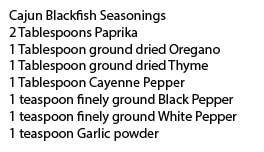 Additional Cajun seasoning is optional. In a large mixing bowl, combine the crabmeat, red pepper, onion, scallions, parsley, and garlic. In a small bowl, stir together the egg, mustard, lemon juice, Worcestershire, and Tabasco. Gently fold this mixture into the crabmeat mixture; then add 1/4 cup of the bread crumbs, mixing with a light touch just until combined. Form 8 patties, using 1/2 cup of the crabmeat mixture for each. The patties should be made in ovals about 1/2-inch thick and 3 1/2-inches long. 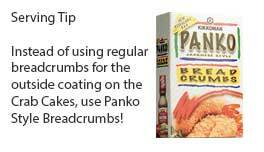 Coat the patties with the remaining bread crumbs and place them on a wax paper-lined baking sheet. Refrigerate until set, at least 1 hour. Heat the oil in a large skillet, preferably nonstick, over medium heat. Add 4 of the crab cakes at a time. Cook until golden, about 5 minutes. Adjust the heat as you cook so that the fat maintains a steady, gentle sizzle. Gently flip the crab cakes with a spatula and cook until golden, about 5 minutes. Serve hot, garnished with lime or lemon wedges, with a small cup of salsa on the side, if you like. Combine first 6 ingredients in processor and blend until almost smooth. Spread 1 heaping teaspoon seasoned butter over each lobster tail. In a small saucepan melt remaining seasoned butter; keep warm. Grill lobster tails, shell side down, 6 minutes. Turn over and grill until meat is just opaque in center, about 2 minutes. Serve with melted butter. Preheat a griddle or frying pan on medium heat. Cut the loaf of bread into quarters and slice each quarter in half lengthwise for the sandwiches. Spread the mustard or mayonnaise on the bread. Then make each sandwich by layering the pickles, roasted pork, ham, and cheese. Lightly coat the cooking surface of the griddle or frying pan with cooking spray or butter. Place one sandwich onto the hot surface. Put a clean, heavy skillet on top of the sandwich to flatten it. Press the bread down to about 1/3 of its original size. 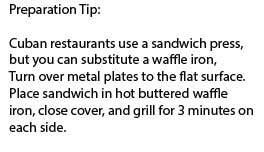 Leave the skillet on top of the sandwich and grill for one or two minutes. Lift the heavy skillet, turn the sandwich over and repeat this step for the other side of the sandwich. The cheese should be melted and the bread golden brown. Slice each sandwich in half diagonally and serve. To make graham cracker crust: Preheat the oven to 325°. Break up the graham crackers, place in a food processor and process to crumbs. Add the melted butter, sugar and salt and pulse until combined. Press the mixture into the bottom of a 9-inch pie pan, forming an even layer on the bottom, sides and edge. Bake the crust for 10 minutes. Remove from the oven and allow the crust to cool. To make filling: While the crust is resting, in an electric mixer with the wire whisk attachment, whip the egg yolks and lime zest at high speed until fluffy, or 5 to 6 minutes. Gradually add the condensed milk and continue to whip until thick, 3 to 4 minutes longer. 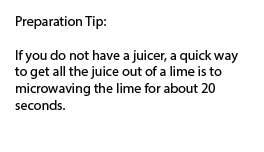 Lower the mixer speed and slowly add the lime juice until incorporated. Pour the mixture into the crust and bake for 15 minutes, or until the filling has just set. Cool on a wire rack, and then refrigerate for 20 minutes. To make topping: Whip the cream, confectioners' sugar and vanilla until nearly stiff. Evenly spread the whipped cream on top of the pie, and place in the freezer for 20 minutes prior to serving.